I definitely consider myself anti form-over-function. Superfluous design elements frustrate, whether in hardware or software. If it doesn’t do anything I don’t want it there. It’s that simple. As such my default settings on the phone are a black theme that retains the most of the default icons, the theme animations off, and a basic clock screen saver which was default on the N8 anyway. The black theme for me offers the best screen contrast and readability, and I generally have no interest in fancy icons, or theme elements whizzing by, rotating or doing summersaults. That’s what I wrote when I first had the N8 and I still believe that visually there’s not that much wrong with it. It is clear though that eye candy is important for many even if it is not a priority for me. 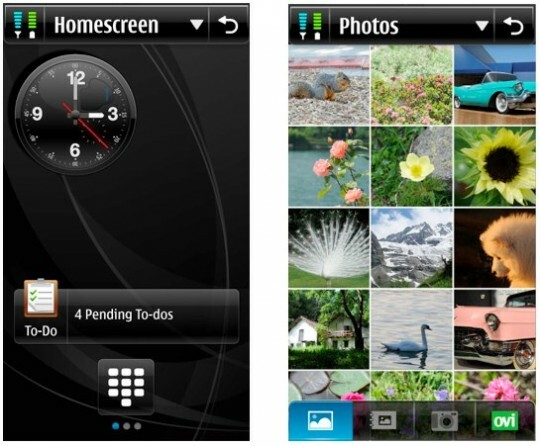 Symbian’s operational paradigm however is a different matter. It’s something I didn’t pick up on fully in the two weeks I reviewed the N8, but it has been nearly a month now since it has become my primary phone and the quirks are becoming more apparent. Let me say that the usability of the phone is not in question. In my mind I know and expect all the quirks and with very minor adjustments nothing surprises on the phone but that said, if it can be improved, then why not. I notice this in particualr when fiddling with my father-in-laws 5800 Xpress Music and one of my best friend’s Galaxy S. Despite being of the same breed the 5800 and the N8 are almost speaking a different language from an operational perspective, primarily to do with the double tap story. I found the N8 more similar to the Galaxy but again a different language. The difference between the newer handsets and the 5800 was an issue of simplicity. It did seem like harder work with the 5800, with N8 have a better organised menu structure and the lack of double tap making the experience smoother. There are still flaws in the N8s operational paradigm however. That’s half the steps required. 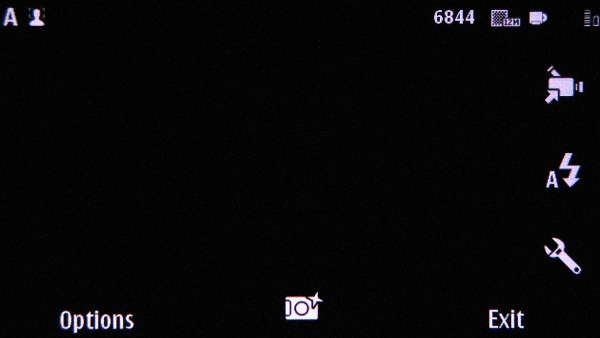 In fact, the top of the camera interface, in between the icon for scene mode and the memory indicators is wasted space. All ten icons found in the spanner/settings menu could be moved there, and tapping would just initiate a drop down menu with the relevant settings and a single tap to initiate. The icon to switch to the photo gallery could then replace the spanner. I’m no designer and this could look messy, I’m terrible at visualising stuff in my head, but having access to these settings without having to open too many menus would be ideal. I think it’s great that the N8 allows one to fiddle with the camera settings, unlike say with the iPhone which only allows for toggling of flash. I’ve had lots of fun trying out different settings instead of letting the camera do everything but sometimes, especially with an energetic 18 month old as my primary subject, it takes too long to tweak the settings. To the general menu. The ‘soft keys’ at the base of the screen are obviously artifacts from the button driven days, and it would be wise to remove these. They do take an awful lot of space, in portrait mode each ‘button’ is 120X60 pixels. I actually want these gone, and in the homescreen, the only indicator at the base should be the homescreen dots and above that, some sort of phone icon to access the dialer. Invoking the options menu, for example to edit the homescreen or rearrange icons in the main menu, should be via a long press. That’s another thing I find a little inconsistent. In the homescreen view you have options, but you can also use a long press (though it’s only for editing), and in the main menu, long press is inactivated, but you can edit the menu via the options key. A consistent means of operation would be lovely, thank you very much. The only problem with removing the icon would be to go back once in a folder/menu. Toggling between menu and homesreens is already facilitated by the menu key. Going back could be achieved using a discrete ‘back’ arrow at the base of the screen, replacing the indicator dots found on the homescreen. Now of course the ‘soft’ keys are available in most applications as well, but there are exanples of some which don’t, like the City Seeker guides for examples, and the twitter app TwimGo, illustrated below. 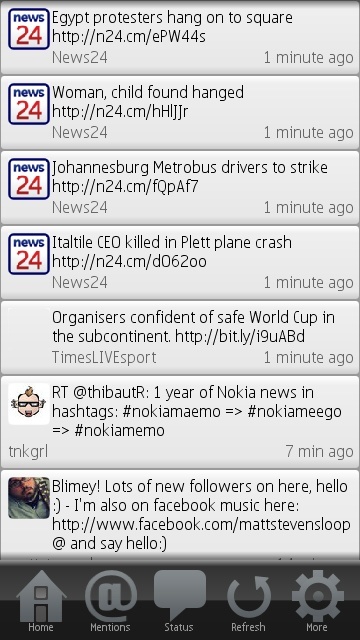 In particular, I like the way that TwimGo makes use of drop down menus, for any additional options/settings. Some general usability comments follow now. Some apps still retain the double tap, the camera being the obvious one. Regarding text input. I toyed with Swype and this may sound weird but I have gone back to the default keyboard. I found that Swype was making me lazy; I don’t really think about what I am writing because the AI handles everything. The prediction and text correction is more than adequate, and my typing speeds on the keyboard are vastly improved. The major gripes I have with it at the moment is first the lack of split screen input. I have been using the Opera keyboard for their browsers, and the keyboard in the latest alpha of Gravity, and it really is a necessity. What’s weird is that in Ovi Maps and the search widget, input is split screen and it’s much more user friendly. The browser, other than the noted performance issues, needs a UI overhaul too. Like the camera interface, things are unnecessarily buried. Going back and forward between pages should not be such a chore. Back, forward and reload buttons should be available at all times at the base of the screen. The address/search should be easily available, not necessarily sticky. I like how in Opera, you tap the top of the page and you are taken back to the address bar. This sounds like a rant, but in fact I’m just merely looking to see how the current operational paradigm could be tweaked without having to make dramatic changes. 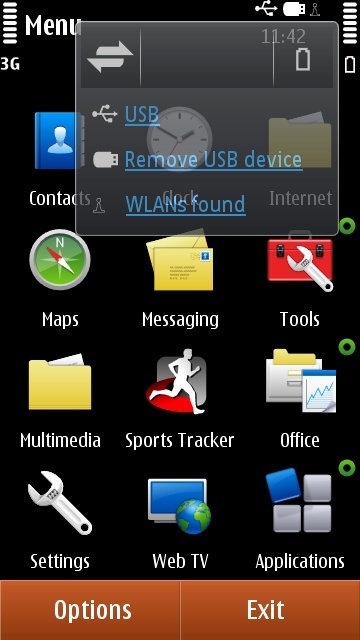 Something that I like about the N8 for example is the shortcut/notifications invoked by tapping the battery icon. It’s not as ‘pretty’ as the Android system but it works, and I found myself using it a lot. Icons for missed calls, messages etc already show up here and I like that tapping on the area expands the notifications. I like that I can switch acces connectivity here, switch to power saving mode, and for example when a USB is plugged in, I can safely remove from here as well. Ultimately what I think is needed is a more consistent experience across each level of the OS and I don’t thinj that there is a huge amount that needs to change from an operational perspective just thinking how I would like it to work. The visual side of things, well that’s a different game altogether. ← The Nokia N8 PR 1.1 update broke my email!